Louis Marcoussis was the son of Gerszon Markous, who was a cultivated industrialist living in Warsaw. In 1901, he left to study painting at the Fine Arts Academy in Krakow, in the studio of the Impressionist painter Jan Stanislawski. He spent time with the group Young Poland, which was composed of writers and artists keen on French culture. Thanks to the savings that he got from his father, Marcoussis went to Paris in 1903. He spent three months at the Académie Julian, studied in Jules Lefebvre’s studio, and met Roger de La Fresnaye and Robert Lotiron. As his father faced financial difficulties and could no longer support him, Marcoussis contributed to the journals La Vie parisienne and L’Assiette au beurre in order to earn his living. In 1904, he visited Spain and stayed at his uncle Milner’s in San Sebastian. In 1910, he met Guillaume Apollinaire who advised him to adopt the nickname Marcoussis, which was the name of a village near Montlhéry. He introduced him to Georges Braque and Pablo Picasso. Marcoussis joined the Cubist movement and exhibited his work together with the Section d’Or (Golden Section) group. 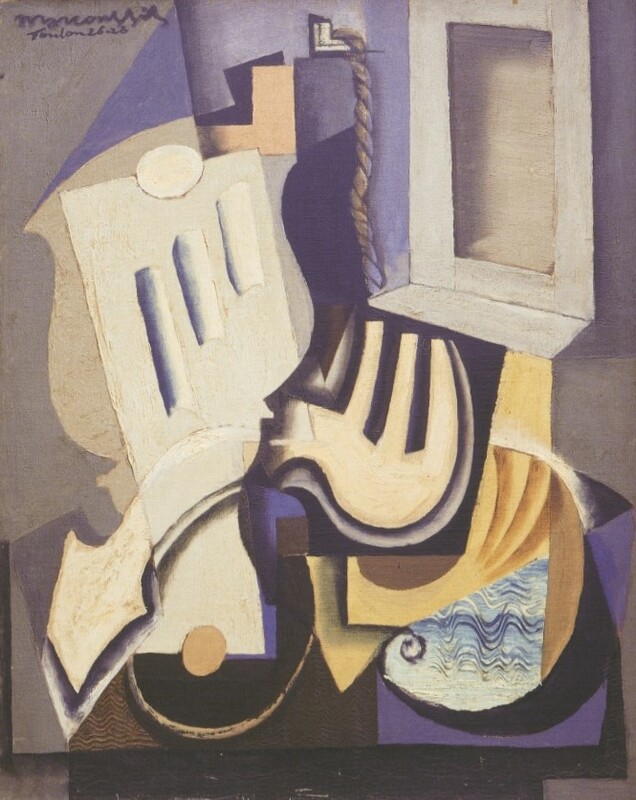 In his paintings, he used typical Cubist subjects, such as guitars, pipes, glass bottles and glasses on pedestal tables, playing cards, and packets of cigarettes. He spent time at the Café de L’Ami Émile, on place Ravignan in Montmartre, and became friends with Max Jacob, Juan Gris, Albert Gleizes, and Francis Picabia. On July 13, 1913, he married Alice Halicka. The young couple settled in 61 rue Caulaincourt, where they lived until 1939. When World War I broke out, Marcoussis enlisted in the French army and was awarded the rank of lieutenant and the Croix de Guerre (war cross). In 1919, 1921, and 1923, Marcoussis traveled to Poland. At that time, he started to take an interest in the reverse glass painting technique, which he used until 1929. On March 3, 1922, Alice Halicka gave birth to their daughter Madeleine. In 1927, Marcoussis stayed in Brittany, at Kérity and then Tréboul near Douarnenez, where Max Jacob visited him from Quimper. That same year, he spent some time in Toulon. Marcoussis’s work became more distant from Cubism and reminiscent of Surrealism. He painted series of Large Shells (1927) and Still Lifes. Between 1931 and 1937, he gave up painting and devoted himself to engraving. From 1933, he taught engraving at the Schläepfer Academy in Montparnasse. He produced a series of etchings for Apollinaire’s volume of poetry Alcools in 1934 and resumed painting in 1937.